Dante’s Explorers – ACRONYM Inc. Your average movie critic would categorize Joe Dante as a low-rent Steven Spielberg, and unfortunately, there is enough evidence in his films to support this badly-made assertion. Both Gremlins and InnerSpace have that Spielberg-ian flavor to their form and execution, and the fact that Spielberg took Dante under his wing early on only adds to that notion. But where Spielberg seems to be able to mine the Hollywood Mainstream for blockbusters and money makers, Dante seems only able to skirt the edges in ways that earn him little cash. A quick glance at their respective filmographys will instantly reveal who is the household name and who isn’t; as it stands, the closest thing to a blockbuster Dante had was his Spielberg-produced horror movie, Gremlins. But Dante’s films tend to be more nuanced, and function on levels that most of Hollywood fare don’t (or can’t). While on the surface, Explorers seems to embody the Spielberg-ian notions of Wish Fulfillment Fantasy and Childhood Nostalgia, in a much more direct sense, Explorers is a film that explains how to navigate your High School years through the development of fantasy coping mechanisms. 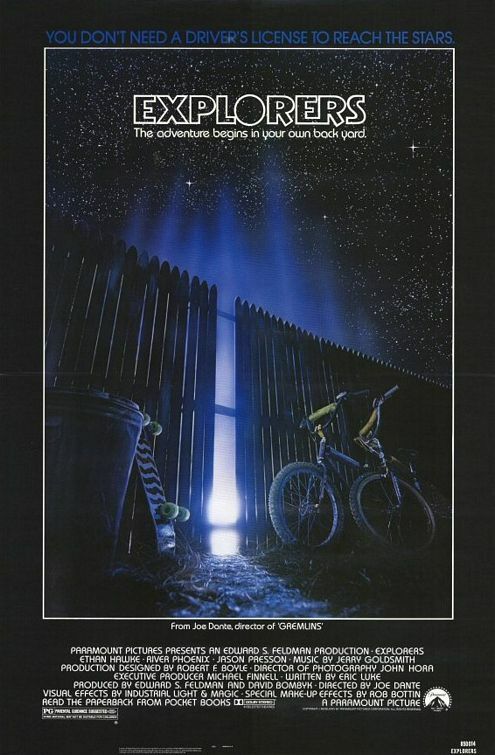 The overall plot of the film is typical of youth-oriented adventure movies: a trio of friends build a spaceship in their backyard, using circuit designs dreamed by Ben (Ethan Hawk), constructed by Wolfgang (River Phoenix), and named by Darren (Jason Presson, the only one of the primary actors to not have a big Hollywood career afterward). When they iron out all the kinks in their ship, they realize that they’ve been called by a pair of aliens in deep space, whom they go to visit, where the real fun begins. Eventually they return from their heroes’ journey wiser, experienced, and having made it through the “underworld” relatively unscathed. Odysseus himself could not have planned the trip better. The main character of the film, Ben, is immediately characterized as an outcast. The target of bullies and being raised by a single parent, his refuge is the world of Sci-Fi. Film, books, comics, anything otherworldly helps him cope with his everyday misery, while he secretly pines for a rich girl (Lori) that he can never obtain for obvious (class) reasons. In their own ways, Wolfgang and Darren are similarly outcast; Wolfgang is immersed in Science, to the point that he can think in no other terms, while Darren obsesses over his scooter and his Walkman, attempting to ignore the realities of his own drunken father at home. Using the resolve they gain from their media obsessions and interests, they manage to find a way to survive through the complex world of High School when it’s clear that they just don’t fit in. However, once these three kids take the first step into their Odyssesian “underworld,” they find themselves crossing the threshold of the very media Ben is obsessed with in the first place. First, they create an energy sphere out of thin air, as if it has been called forth from the very media Ben idolizes. Once it has been created, it literally moves “through” the very books and Comics that Ben collects. (As if the idea of an energy sphere was trying to return to the world it came from.) Later, the sphere takes Wolfgang on a Journey Through The Center of The Earth by “accidentally” tunneling through a mountainside they happen to be experimenting upon. After they finally build their ship (a creation comprised of things they find in a disused junkyard, where the mainstream casts off things no longer important), they choose to make their first destination the local Drive-In (Darren: “Where’s all the action on a Friday Night?” Ben: “The Drive-In!”). However, the film takes a decidedly strange turn once they get there. Not only do our young heroes start interacting with the Drive-In screen itself, the movie they watch starts to interact back. (Not only with them, but with us.) What’s playing on the screen is Starkiller, a fictional film within a film, and an obscure George Lucas reference, too. (Luke Skywalker’s original name, in the early drafts of the first Star Wars script, was Luke Starkiller.) The hero of this film, Starkiller (played expertly by Robert Picardo, in one of his two roles for Explorers), not only embodies everything that a Sci-Fi, B-Movie, Drive-In character should, but his reaction shots all revolve around things that are happening outside of his own film. Interacting with media, in the world of Explorers, works two ways: you get out of it what you put into it. When the boys finally allow the craft they’ve built to take them to the stars, they encounter a pair of aliens who act as if they have stepped out of a Sci-Fi films themselves. (Robert Picardo plays Wak, effectively stepping out of Starkiller and into Explorers. It’s only fitting that he plays a hologram in Voyager, to further toy with this tension.) Both Wak and Neek learned English from our own movies and television, too. As Ben and his companions get to know Wak and Neek, they discover that the aliens are just as obsessed with media junk culture as they are. When the boys return to Earth, the occasion is even more anti-climactic; rather than the triumphant, heroic return of three space travelers who have touched the stars, met alien life, and made it home to tell the tale, they accidentally crash into a lake, to no welcome or fanfare, and have to escape from their home-made vehicle in much the same way that your work-a-day Astronauts might after a water landing. The crushing reality of their experience is so overwhelming that their craft is sucked instantly to the bottom of the lake, irretrievable. As Dante is quick to point out, the ending that exists is not the one he wanted. Between budgetary constraints and studio pressure, the film was never properly “finished.” Further difficulties in distribution, promotion, and release made the movie even more obscure at the time it came out, disappointing Dante further. (Especially after the phenomenal success of his previous film, Gremlins.) But the ending that is tacked on, no matter how nostalgic and sentimental it might be on the surface, suggests in a subtle way that the “happily ever after” vision we see is actually anything but happy once run through a Dante-filter. Ben, Wolfgang and Darren are able to do something no other human has been able to, but only by clinging to childhood obsessions and dreams in order to do so. Ben is smarter and more perceptive than those in the Mainstream because, unlike Wak and Neek, he only indulges in certain obscure elements. He has learned how to traverse the media landscape in a way that he enjoys, and enables him to accomplish that which no one else can. But at what cost? He can never tell anyone of his outer space adventures, and most likely, will not be able to recreate them, either. These dream achievements are incredible and fantastic, but become less and less fulfilling when you have to turn the movie off and return to real life. This is most poignant through the love-interest subplot with a girl named Lori. Ben never manages to succeed with her during the film proper, in spite of several attempts to do so. (With hindsight, I’m actually surprised how much Lori reminds me of my first crush, but that’s another story.) Finally, in the closing minutes of the film, he is able to connect with Lori, not only emotionally, but physically. (They kiss during a flying dream-sequence.) This connection, though, only occurs in his dream; it happens shortly after Ben falls asleep, bored to death at school, a place he hates, and where he is characterized as being unsuccessful. That is not to say that there is no joy in watching Explorers. The movie is a repository of cinematic references and childhood nostalgia that will really hit home for anyone obsessed with Warner Brothers cartoons, old Sci-Fi films, or someone who is looking for an adequate third to follow a Goonies / Stand By Me double feature. But don’t be surprised if the meta-content starts to contort your perspective on this particular feature, or that the sad realities of growing up come crashing down on you as you start to put together exactly what Mr. Dante was trying to tell us. What delighted me as a child is an all-to-horrific reminder in the here and now, of how painful growing up really can be, and the things you have to leave behind in order to do it successfully. Cheery stuff, no?